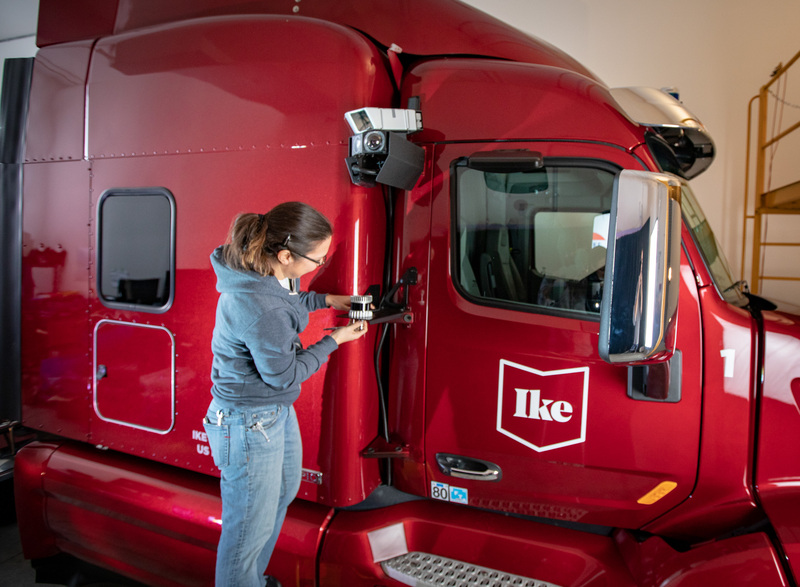 Ike, the autonomous trucking startup founded by veterans of Apple, Google and Uber Advanced Technologies Group’s self-driving truck program, has raised $52 million in a Series A funding round led by Bain Capital Ventures. Redpoint Ventures, Fontinalis Partners, Basis Set Ventures and Neo also participated in the round. Bain Capital Ventures partner Ajay Agarwal has joined Ike’s board. Ike’s funding round will help the company expand beyond its 30-person team as it drives forward with its mission to build a commercial product at scale. It’s a mission — expand and deploy — that sounds a lot like other autonomous vehicle startups. But that’s where the parallels end. Ike’s three founders — Jur van den Berg, Nancy Sun and Alden Woodrow — aren’t pushing to have the first self-driving trucks on the road. It’s a declaration, and one the company outlined Tuesday in a blog post on Medium, that lies in contrast with a budding and cutthroat industry often described as being in a frantic race. But then again, these founders were in the thick of those buzzy, heady days of 2016 and 2017, when startups were being snapped up by automakers and big tech companies and term sheets were raining down. Van den Berg and Sun were both working at Apple’s special projects group when they left to join Otto, an autonomous trucking startup that was acquired by Uber in 2016. Woodrow, who was product lead of Google X’s Makani project, would also end up at Uber ATG by February 2017 as group product manager of its self-driving truck program. By 2018, the last of Otto’s founders had left Uber and the self-driving trucks program was in free fall. Sun, Woodrow and van den Berg left Uber by spring 2018 to launch Ike. A few months later, Uber announced it would shutter its self-driving trucks unit to focus on autonomous cars. In short, Ike’s founders have seen a thing or two, including missteps and exciting breakthroughs, splashy reveals and a heaping spoonful of hubris. “The temptation when you’re working on this technology — because there’s so much potential and because there’s so much excitement for it — especially for small companies in the early stages, is to try and hack something together and try to get up and running really quickly,” Alden Woodrow, co-founder and CEO of Ike told TechCrunch in a recent interview. That’s not what Ike is doing, Sun noted. Instead, the company is taking a systems engineering approach and sprinkling in a little Silicon Valley agility, Sun said. What this means is Ike engineers aren’t focused just on quickly building out integrating self-driving software and sensors to get on the road. Instead, the company says it’s laser-focused on a systems-based philosophy. Ike is working on determining the design and architecture first before laying the foundation — to use a comparison to building a home. It’s focused on an entire system that accounts for everything in the self-driving truck, from its wire harnesses, alternator and steering column to durable sensors designed for the highway, computer vision and deep learning that allows it to see and understand its environment and make the proper decisions based on that information. That systems approach also includes proper validation before testing on public roads. This will likely mean Ike’s self-driving trucks will launch after others. But its founders believe that when they do hit the road at scale, it will be a validated and valuable product that won’t need constant tweaks or even a pivot. The heads down, systems approach is a reflection of broader changes within the industry, which has since sobered up. Many companies, even those “ahead” in the race to deploy autonomous vehicles, have discovered the problem is harder than expected. The days of time-lapsed self-driving videos, demos and bold claims have largely been replaced with a quieter let’s-get-to-work-now approach. Ike, which is named after President Dwight D. Eisenhower and the U.S. interstate system he helped create when he signed the Federal Aid Highway Act, is trying to build a system that allows trucks to drive safely and reliably on the highway without a human driver. However, that doesn’t mean there isn’t a place for human drivers under Ike’s model. The company intends for its trucks to only drive autonomously on highways. From there, human truck drivers would move the loads between the highways. Ike stands apart from other self-driving truck startups in other ways too, namely its decision to license autonomous delivery company Nuro’s vehicle software stack. The copy of Nuro’s autonomous vehicle stack was a “hard fork,” Woodrow explained, meaning Ike doesn’t have an ongoing technical connection with the company. Nuro does have a minority stake in Ike. Instead, Ike gained a copy of relevant items (and the IP rights to it) that Nuro built, including some hardware designs, the autonomous software stack and the core infrastructure, which includes data logging, maps and simulation. Ike won’t be staying off the roads for long. The company is planning to begin testing its self-driving trucks (with human safety drivers behind the wheel) on public roads this year. Still, Ike’s founders aren’t set, or even focused yet, on where it will first deploy commercially.